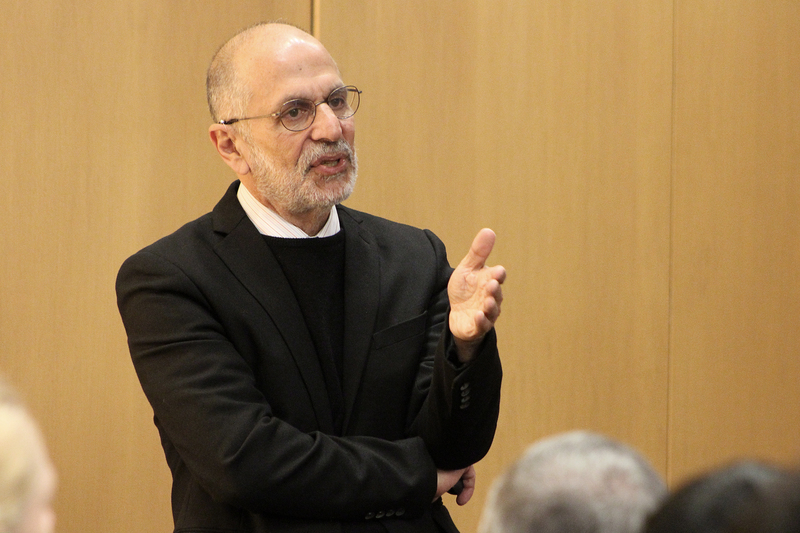 As quickly as renowned materials chemist Robert J. Cava could be introduced, space within the main seminar room of the Physics Research Building had reduced to standing room only. Cava’s presentation of “Superconductivity: Where we are and where we are going,” at The Ohio State University on Oct. 30 drew students, researchers and faculty members from a wide range of disciplines. The talk was the latest installment in the Distinguished Lecture Series hosted by the Institute for Materials Research (IMR). Cava, the Russell Wellman Moore Professor of Chemistry at Princeton University, presented an overview of the field that covered not only the emergence of superconductivity, but some early experts’ expectations of its development and potential future. Superconductivity, the transmission of electrical current with zero energy loss, recently passed its centennial. And, in that time, the lossless transmission of energy has found a variety of important uses in modern society, Cava said. Cava’s lecture was given from the perspective of his personal research: the discovery of new superconducting materials. He chose not to give a technical talk, but rather articulate the domains of physics, chemistry and materials science for the broader range of students and researchers in attendance. Cava is the former Chair of the Chemistry Department and former Director of the Materials Institute at Princeton University. His research in new materials emphasizes the relationships between chemistry, crystal structure, and electronic and magnetic properties. “He is a pioneer and world-renowned leader in a lot of the important discoveries in condensed-matter physics, chemistry and materials research, including high-Tc superconductors, topological materials, magnetic oxide, and many other materials,” said Fengyuan Yang, professor in the Department of Physics, in his introduction of Cava. After earning his Ph.D. in Ceramics from the Massachusetts Institute of Technology in 1978, he was a National Research Council Postdoctoral Fellow in Solid State Chemistry at the National Institute of Standards and Technology. Before going to Princeton University in 1997, Cava worked at Bell Labs for 17 years, where he was a Distinguished Member of Technical Staff. He is a Fellow of the American Physical Society, the American Ceramic Society, and the Neutron Scattering Society of America, and is a member of the U.S. National Academy of Sciences and a Foreign Member of The Royal Society of London. His work has garnered numerous honors, and he has more than 60,000 citations.